Video Brochures had a great year in 2015 and we expect this trend to carry through to 2016. The video brochure market has grown rapidly this year - with many companies realizing that video brochures give a product an undeniable USP. The re-order rate for our Video Brochures has been in excess of 70% and feedback on customer campaigns has been hugely positive, leaving clients over the moon with their results. 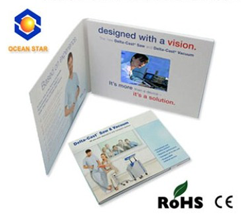 We, at Oceanstar feel the localising, nature of video brochures offers something no other marketing material can provide in the same way and, for now, that USP makes them relevant. - Put simply, Once our brochures are put into your customers hands, they're going to see, hear and feel the message you are trying to convey. Video Brochures, Smart Scooters, Bluetooth Gadgets and much more! Oceanstar are exhibiting our latest and greatest products in Hong Kong this month. Come and visit our team at the world famous Global Sources Electronics Exhibition. Please feel free to come and visit us at any of these great locations. Video Brochures are a marketeers secret weapon. A recent marketing survey shows that 89% of people agreed that video marketing has a more powerful effect on them than print alone. The sales impact offered by these innovative products is real. Year on year demand has surged and shows no sign of slowing. Our range, supported by our very talented engineering team, can produce any designs you can think of. In fact, we love a challenge. So feel free to contact us anytime and let's turn your dream advertising project into a reality. Welcome to Oceanstar-gift.net our brand new mobile and tablet friendly website. Always looking to be Industry leaders, we set out with the help of 89seo.com to build a website that would not only aid us in the promotion of our quality products but to also provide you with a simple, straight-forward user experience. Making it far easier for you to find the products you need. Oceanstar-gift.net is proud to say that their new format is one of the 1st of its kind within the Chinese commercial sector. We hope you will recognise our willingness to always strive to improve both our business and our clients experience, at all levels, when working with us. We hope to see you at our upcoming trade shows in April 2015 at the Global Sources electronics trade show in Hong Kong.